Geek Lit Etc. : Who's to say a lady in trousers would be a bad influence? Who's to say a lady in trousers would be a bad influence? Betrayal, human cargo and the Chinese underworld all converge on Black Heath Manor in Cindy Spencer Pape's Dragons & Dirigibles. Miss Melody MacKay has no idea why her prototype airship came crashing to the ground. It doesn't seem as if any of the new parts failed, and she certainly double-checked her boiler before she left. Nevertheless, she's come crashing down in the Devon countryside, and has suffered an unbearably ladylike twisted ankle in the fall. Luckily, Victor Arrington, Earl of Blackwell, was out patrolling the seaside at the time. A former Royal Navy Captain, he's heard that there have been some disruption along the coast, and has been trying to catch whoever is making such a disturbance. With the increase in smuggling plaguing the country, one can never be too careful when there are odd occurrences along the water. Upon finding the injured Miss MacKay, he hardly knows whether to be more upset that she's been piloting a prototype, silent dirigible, or that she's doing it in trousers. Although there is something oddly charming about that fiery, bold, and all to well educated young woman. Before long, Victor has much more on his plate than a lady who refuses to act like one. The entire village had turned against him, though he hasn't a clue why. As he tried desperately to hold his household together, as well as raise his orphaned niece, the situation takes a turn for the worse when a dead body washes up on shore. As always, when one of theirs is in trouble, the rest of the family comes along to help. This time, we get Tommy Devere, along with Dorothy and Nell Hadrian as back-up for Melody. An eclectic group, to be sure, and this time it's not only our main characters who are having romantic difficulties. In these seven stories, Cindy Spencer Pape has created a wonderful world full of characters the reader truly cares about. Instead of having to establish the world and its rules every time, Pape can jump right in with dirigible crashes and mechanical crabs. This novella is much lighter on the magic than earlier works, which is a bit unfortunate since that is one of the most charming parts of the world, but I suppose not every story has to have unsettled ghosts or ravenous vampyres. 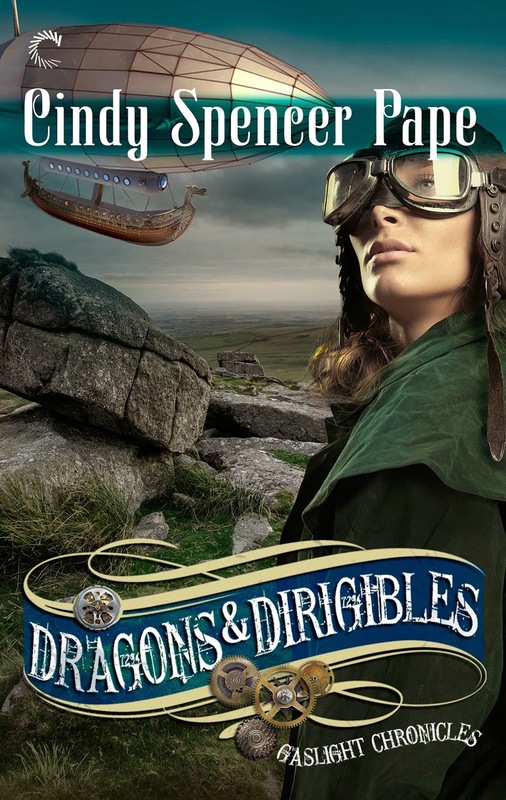 Dragons & Dirigibles is a worthy continuation of 'The Gaslight Chronicles', and as always leaves the reader craving the next installment. Highs: Victor's young niece Emma neatly walks the line between precocious and annoying throughout. Lows: I wish there had been a neater resolution between two of the secondary characters, but I suppose that will have to wait for the next story. Verdict: While missing much of the fantasy element that makes this series so charming, Dragons & Dirigibles still holds its own. As the world ends, families come together.